This is the follow-up Ebook to the free lessons you find on the website. It contains all of the material from my site and a whole lot more, including audio tracks so you can hear how everything should sound. And, the price is right! You would pay more than this for one private lesson. Click here to look at the table of contents of the book. Thanks for providing a great website!! I used your website to learn the mountain dulcimer. You present the information so clearly and add audio just at the right times. I enjoyed how you gave a handful of lessons to get started and ultimately to get a feel for what your eBook was like, stating if you liked it so far, you'll get this and more with the eBook. Perfect! I also appreciate how you addressed iPad issues upfront when downloading the eBook as this is how I use your information with my dulcimer. Keep up the great work. Thanks for making your information affordable! I look forward to continuing your instruction with the eBook. Thank YOU, Sue! You made my day. This e-book is a 36 page PDF lesson course for learning to play the Appalachian Dulcimer. The lessons will take you from the basics of tuning to playing 10 songs. Included with the e-book are 17 MP3 audio tracks which demonstrate every song in the course and provide tuning tracks too! 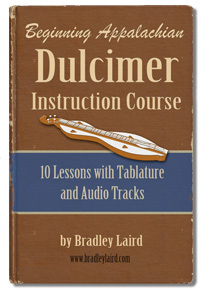 All of the music is written in tablature for dulcimer which is fully explained in the course. If you have been enjoying the free dulcimer lessons on my website, this is the obvious next step! The complete downloadable course includes even more material! *Additional material not found on the website. All of the songs and exercises have been typset in a full 8.5" x 11" format for easier reading or printing. The 17 audio tracks which accompany the course are embedded in the PDF eBook file and are also supplied as individual MP3 tracks which you can load into iTunes or any other audio player. Printable 36 page PDF file format eBook with 17 MP3 tracks, 45.9 MB file size. Only $15 Your purchase, in addition to teaching you to play your dulcimer, will buy me a cup of coffee and the cats get another sack of food. Yes, that's really the sort of thing I do with the massive wealth I accumulate by helping other folks learn to make music. My banjo books keep the dog fed.